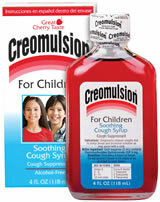 The same Creomulsion results you trust is specially formulated for children. Dexotromethorphan, the same active ingredient in Creomulsion Adult Formula, is just as safe and effective for children, but this formula was created to be easier on their delicate systems. The cherry taste they love takes the struggle out of taking cough medicine, and makes Creomulsion For Children is the quickest way to get your child feeling better in no time! The same Creomulsion results you trust – specially formulated for children. Dexotromethorphan, the same active ingredient in Creomulsion Adult Formula, is just as safe and effective for children, but this formula was created to be easier on their delicate systems. The cherry taste they love takes the struggle out of taking cough medicine, and makes Creomulsion For Children the quickest way to soothe your child’s cough! Works by coating the affected areas with a thick soothing base, designed to alleviate your child’s cough at the basic level – the cough control center. Recognizing the need to provide Creomulsion quality, but fit for a child’s sensitive system, in 1954 the popular Creomulsion cough medicine introduced its new formula for children.